Microsoft last month announced the Surface Book 2, the first new version of Redmond's laptop since the original dropped in late 2015. The new offering boasts faster hardware (up to an Nvidia GTX 1060 GPU, for example) and improved battery life, among other perks. But, what do the reviewers think? Embargos lifted for the Surface Book 2 on Thursday, providing perspective buyers a detailed look at Microsoft’s latest. The general consensus seems positive but let’s dig in deeper for a more thorough analysis. Your eyes, therefore, are sucked toward the big, bright, vibrant screen. Our Surface Book 2’s display pumped out 412 nits, more than enough. And while a 3.2K IPS display might not quite reach that magic 4K milestone, the superb visual quality lives up to the Surface brand. More pixels would have negatively affected performance and battery life. It’s a good tradeoff. 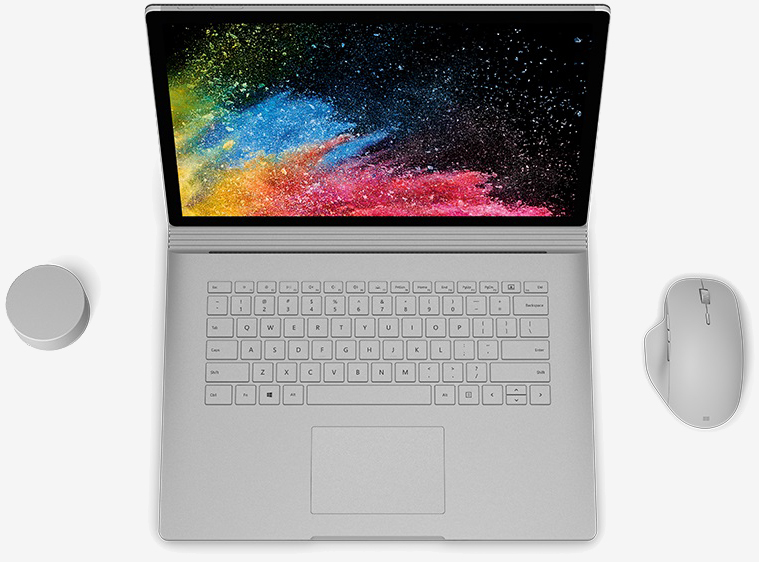 Though Microsoft doesn’t tout the Surface Book 2 as a content-creation machine as it does the Surface Studio, the Book 2 does include both of its color profiles: standard RGB, and its “enhanced” profile, which makes colors a bit more vivid. If you’d like, you can also use the Surface Dial peripheral on the ten-point touchscreen. Unfortunately, the Surface Book 2 reclines to about the same 50-degree angle as the original Book, not nearly flat enough to let the Dial rest without sliding to the ground. And then there’s the Surface Book 2 15-inch. It turned in an incredible 15 hours and 33 minutes, smashing previous records with ease. Intel’s 8th Gen (Kaby Lake R) chips have allowed for the biggest performance leap in years on the U-series processors used in most flagship ultraportables, especially for multithreaded activities, thanks to bumping core count from 2 to 4. While Geekbench hovered around 3600/7300 on the original Surface Book, on the Surface Book 2, that jumps ~4500/~14,000. That puts it very close to the current 15-inch MacBook Pro on CPU performance, while featuring a far better GPU. Granted, plenty of Windows ultraportables already have or will get Intel’s 8th gen chips, but it’s still a significant improvement worth mentioning. Normally this type of performance bump is only achieved by jumping up to more power-hungry processors. Then there’s the graphics. While the Nvidia 1050 on the smaller model should perform decently for many titles at medium settings, the Nvidia 1060 makes the 15-inch Surface Book a veritable gaming laptop. It should handle 1080p gaming on high settings at around 60fps with aplomb – Rise of the Tomb Raider netted me around 70 fps. Depending on your frame rate tolerance, you might even be happy pushing lighter titles like Portal 2 and Overwatch closer to the native resolution. The fans will flare up when playing games, by the way, but the Surface Book 2 never gets uncomfortably loud or hot thanks the separation of the GPU and CPU into the base and lid, respectively. In practice, all that power means everything about the Book 2 runs super smoothly. Though not at first: when I first got the computer, it wasn't configured to take advantage of the beefy graphics card, so even when I played games it was trying to use the graphics integrated into the processor, and struggling. Once I updated Nvidia's drivers and told the Book 2 to use the chip, the thing screamed. I played Assassin's Creed: Origins at high settings with virtually no problems whatsoever, and ran my usual cadre of browser tabs, Photoshop windows, and Netflix sessions without so much as a hiccup. Amazingly, the Book 2 runs virtually silently through it all. Only once did I manage to get the fan really whirring, and that was while I was running benchmarks. The best match for Microsoft’s new Surface Book 2 is Apple’s MacBook Pro. Providing an answer to Apple’s option, but with Windows-specific strengths like a touchscreen and detachable display, is really why the Surface Book 2 exists. The new 15-inch model goes one step further in matching and even beating Apple’s latest MacBook Pro lineup on paper. It’s a hefty and powerful laptop just like the original. It’s also a tablet, thanks to that detachable display. Its high-end graphics card and support for Xbox controllers also make it a miniature Xbox One for gaming on the go. Believe it or not, the Surface Book 2 is the first portable Surface computer that you can actually play the latest games on, but it’s more complicated than just that. In almost every way, the new Surface Books look and act identical to the first-generation systems—they're just larger, in the 15-inch guise. But they retain the same hybrid identity: the screen portion contains its own battery and all the core components and can be detached to operate as a standalone tablet. The base includes the battery, the discrete GPU, and the keyboard. The new, larger screen has required some (internal) re-engineering of the Surface Book's hinge and latching mechanism to make them a little stiffer and stronger, but they look virtually identical. The hinge still unrolls to ensure the system remains balanced, and the latching mechanism is still a software-controlled electrically actuated thing.